Learn about the various features of each tab that appears when you add a new section to your eForm. When you add a section, the menu options are similar those in the Add Item menu. In this article, we explain the key differences between the "Add Item" and "Add Section" options. Allows you to enter a heading or label that will appear at the top of the section. Section headers appear in a larger, bolded font and can be used to clearly differentiate sections on a form page or to act as a page header (when using the multi-page form option). Allows you to change the background color to white or grey. You also have the option of adding a border. The Note Formatting tab is largely similar to the one that appears when adding an item. All of the fields are described below. Generates a custom note for this item instead of the caption (which is the default). Allows you to customize the header (e.g. bold, underline, bold+underline, italic). Selecting "placed within quotes" puts quotation marks around answers, if desired. Selecting "grouped together at the end of the section" presents all the negative notes together at the end of the clinical note (e.g. no smoking, no alcohol intake, etc). Allows you to separate items in the clinical note using punctuation, such as periods and semi-colons. Allows you to present this section of the note in a different order from the layout of the eForm. To set this, enter a number indicating the order in which the note should be presented, relative to the other questions. Note that this function will only work if ALL sections in the form have an ordinal number associated with it. 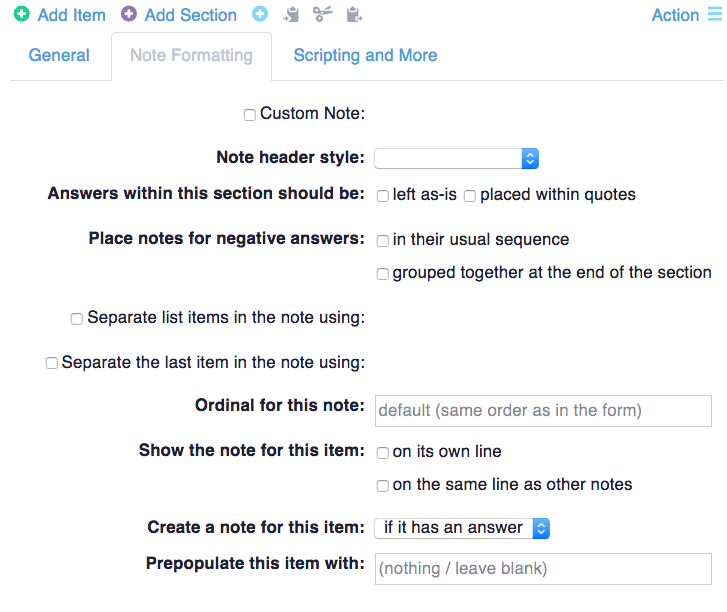 Allows you to define whether the notes for this section should appear on a new line or on the same line as the surrounding notes. Allows you to define when a note should be created for this section (e.g. if it has an answer, always, never, or using an if: statement). The Scripting and More tab is largely similar to the one that appears when adding an item. The various fields are described below. This allows you to name your section(s). You will want to name your section if you wish to hide them under certain conditions or if you are using them in formulas. When using a form for Ocean Studies, this field allows you to define how the column headers will appear when the date is exported as an .xls file. Use this field to force answers to questions by selecting “non-empty”. You can also dictate the type of answer (e.g., email address, postal code etc.). Just like adding an item, this field will allow you to show/hide sections, based on patient characteristics or answers to previous questions on the form. For more details, please refer to: "Scripting and More Tab - Show this field if".